With the system ZDS07W/VTZ05DW it is possible to bypass 1500m and 2800m respectively with a symmetric twisted pair line, e.g. (A-2Y(L)2Y4x2x0.8). Due to system equalisation of up to 40 dB and 60 dB respectively at 5 MHz, droop, active black-level clamping, low pass filter, synchronous pulse control and Sync-Burst-Regeneration, a proper transfer of images is achieved. The transmission end levels are electrically isolated from the transmission line by transmitters. Thus a high electrical strength is achieved. 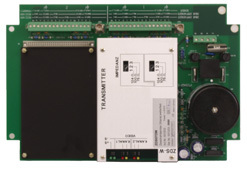 The ZDS07W2 (article number 500471) transmitter is a two-channel component assembly supplied in a weatherproof casing. The ZDS07W4 (article number 500472) transmitter is a four-channel component assembly supplied in a weatherproof casing. The ZDS07W (article number 501203) component assembly is a two-channel component assembly for enhancement supplied in the weatherproof casing of ZDS07W2 on ZDS07W4.